I admit! I've been downright caught by the charms of this other one very appealing album from Deborah Martin. Evidently that we are very far from the Berlin School lands or from the cosmic ambient territories, except that “Eye of the Wizard” is skillfully divided between the acoustics and the electronics with a skillful crescendo between both forms before exploding with a superb, and totally unexpected, piece of Electronica with the wonderful "The Alchemist's Robe". But before all "Dance of the Faeries" begins this new chapter of the sonic stories written in Amerindian ancestral essences by a breeze which makes ring bells and makes dream an acoustic six-strings. The notes are in the tone of an introduction where the singings of the synth feign those of an Ocarina. The approach of ballad starts up after 80 seconds of thematic musing with notes of guitar which dance with manual percussions. Little by little the subtleties of synths weave the atmospheres with a beautiful mixture of fluty singings and sibylline murmurs while the rhythm follows the lively blows from the riffs of the acoustic six-strings. "Watchers" is rather of the ambient ballad kind with a nice and subtle game of sequenced pulsations which form a sort of structure nesting near a tribal down-tempo. Less sibylline and more lively, "Lords of the Vale" is another ballad braided in riffs of acoustic guitar, which is rather lively, and decorated with ornamental ringings. The melody is rather elegiac with nice layers of evasive voices which hum and melt themselves in very film orchestral arrangements. "Waiting" leads us quietly towards the more electronic portion of “Eye of the Wizard”. It's a very meditative piece of music with synth lines in the very scarlet colors which interlace their brilliant shadows in an intense mass of abstruse waves. "Metamorphic" calms our ears scratched by this sound storm with some notes of an acoustic six-strings which drag its dreamer's swage in breezes warmer than these perfumes of violin which always release these elegiac sighs. That does very folk ambient, kind of the Peace'n'Love years, even if the percussions and the shamanic rattles eventually draw a more tribal rhythm. The sonic skin of "Metamorphic" undertakes its 3rd metamorphosis with a more lively structure of rhythm where the quavering of rattles and the percussions forge a passive duel beneath the caresses of the violins which float in a horizon where little by little the rhythm takes the shapes of a setting sun. I liked this a lot. That threw me in the acoustic psychedelic years from our country with the music of Harmonium or still Daniel Berthiaume in the Nouveau Souffle. "The Alchemist's Robe" is simply brilliant. 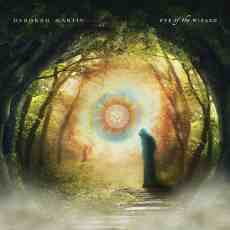 It starts with a very tribal ambient folk mood which throws itself into a superb Electronica. We see nothing coming, we are enthralled and we want to re-hear. And so on, so on.... The title-track embalms of these perfumes, but also of a tribal approach closer to the Middle East. The rhythm stays in suspension with nervous rattles which eventually dissolve their anxiety in philharmonic layers filled by the perfumes of the desert's people. And "Into Mist" ends this fascinating sonic adventure of “Eye of the Wizard” with this delicacy, with this dreamy approach so dear to Deborah Martin's lyrical odes. Yes, I got caught and I adored that. It's the kind of album to which we listen to for the pleasure of the music and to read a book the eyes always riveted on the safe of our soul.